Some of Brazil’s best young players have moved to Europe in the last few weeks, but there are plenty of excellent young players left. Who are they? I have trawled the archives, followed countless rumours and leads, been through player dossiers and match reports, watched hours of video footage, travelled up and down the country watching games, interviewed coaches, fans and scouts. Finally, the list is ready. Okay – I may be exaggerating, but I have made an effort to prepare this list and tell you about Brazil’s best young players. I’ve done it before too: check out the top 10 youngsters playing in Brazil, published in 2011. That list included the likes of Neymar, Casemiro, Lucas Moura and Danilo, who have gone on to play at the very top. One or two of those names (like Ganso) haven’t fulfilled their potential, but seven out of that ten have played for the Seleção, and three of them featured for Brazil in Russia this year. So here is this year’s top ten young players playing their club football in Brazil. Recently departed stars such as Arthur (Barcelona), Vinícius Júnior (Flamengo) and Éder Militão (Porto) are not inlcuded. And I’ve only only considered players aged 21 years and under. Some people will wonder how Gabriel Barbosa (formerly known as Gabigol, until he stopped scoring) made it onto this list. Others will wonder why he is not higher up. It was looking so good for him a few years ago: he won an Olympic Gold medal, scored goals for fun at Santos, he had full caps for the national team and was on the verge of a big money move to Europe. He moved to Inter Milan in August 2016, but things have gone pear shaped since then: in his first season he played just nine games for Inter Milan, scoring one goal, and was branded the worst foreigner in Italy; he had an unsuccessful loan spell at Benfica the following year; and he hasn’t exactly lit up the world on his return (on loan) to Santos this year, with just three goals in 16 league starts. Despite those two years of disappointment, you don’t become a terrible player overnight. Well, perhaps you do, but you still have the potential to become a good player again don’t you? I’m not that optimistic Gabriel Barbosa will come good, but he is still only 21 and shouldn’t be written off completely. I’ve only seen this kid play once, but he did enough in that match to get onto the list. It was against Flamengo and an in-form Vinicius Júnior, who he kept quiet for most of the match. I can’t vouch for Emerson’s crossing, but other than that, he has got all the attributes that a modern full back needs: pace, power, stamina and technique. 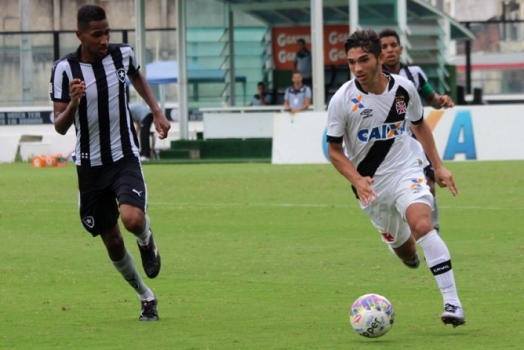 He made made his Serie A league debut for Ponte Preta last year, aged 18, has made five league starts for Atlético-MG this year, and has played for the Brazil u20 side too. And judging by this interview, he seems like a good lad. After some impressive displays for Flamengo’s first tieam this season Thuler is building his reputation. He has only played six league games to date, but he has pedigree having played for Brazil u20s and captained the Flamengo team that won the 2018 São Paulo Junior Football Cup (the most important youth competition in Brazil). I watched Thuler in the recent league game between Flamengo and Grêmio, and although Grêmio forward Jael got the better of him in the air for a goal, Thuler’s all round performance was good. He isn’t blessed with pace, but he is strong, and composed. 7 – Andrey, centre mid, 20 years, Vasco. What sort of midfielder is Andrey? Defensive midfielder or attacking midfielder? Ball player or tackler? Right answer: the sort of midfielder that scores cracking long-range goals. That might not be a proper class of midfielder, but if that’s not good enough to get you into a top ten youngsters list then what is? He has started nine games for Vasco this year and scored three goals, including this strike against Botafogo. Pick that out Jefferson. Andrey knows where the back of the net is, but he has an eye for a pass too. He doesn’t dominate games yet, but he does something every now and then that makes you sit up and take notice. In reality he can play as a defensive midfielder or an attacking midfielder. He has played for the Brazil u17 side, scoring 2 goals in 13 appearances for them. Likely to get more opportunities for Vasco this year. Lincoln hasn’t achieved much yet, but he is considered to be one of the best prospects in Brazil. He was Brazil’s centre forward at the u17 World Cup in India last year, scoring three goals in the process (Brazil were knocked out by England in the semi final). He was promoted to Flamengo’s first team last season and made his league debut as a 16 year old. He is not a first choice starter yet, but has come into games and made a big impact, most notably last week when he scored an equaliser against Grêmio in injury time. He has still got a lot to learn, and it remains to be seen whether he will fulfill his potential. But he knows where the goal is, he is quick, and like most Brazilians he is blessed with a fair bit of skill. There are more experienced forwards ahead of him in the pecking order at Flamengo, but I suspect that may change sooner rather than later. His emergence is one of the reasons that Flamengo are prepared to let Paulo Guerrero go. Liziero was a relative unknown just six month ago, but he has burst onto the scene in some style this season. He can’t take all of the credit for São Paulo’s ascent to the top of the league, but he is now a first team regular and is currently keeping the experienced Jucilei out of the side. Critics might say that Liziero is a water carrier. At first glance, I could see why they might say that, which initially made me hesitant to include him here. But I gave him a closer look against Vasco last weekend, and I was impressed. Not only did he always seem comfortable to take the ball, but he showed confidence, skill and awareness to try some audacious passes. Plus he started the move that led to São Paulo’s winning goal, by making a strong tackle and setting up a counter attack. If he is a water carrier, he is a water carrier that can tackle and has some skills and flair (which basically means he isn’t a water carrier). Overall impressions then: he covers the ground, courageous in the tackle, hard working, good on the ball, has an eye for a pass. He might not be the most exciting name on this list, but if he applies himself well, as he has done this year, then he could go far in the game. He has played 14 out of São Paulo’s 17 league matches, starting 7 of those. It might surprise some people that I have included Léo Santos so high on this list, given that he had only made two league starts for Corinthians at the time of writing. But its not easy for young defenders to break into the first team, especially when the team in question is Corinthians, who have been the best defensive team in Brazil over the last few years. What impressed me most was how Léo Santos took his chance when asked to play in central midfield. I knew he was very highly rated, and has caps for the Brazil u17 and u20 sides, but he has had to bide his time to get his in Corinthians’ first team. With Balbuena going to West Ham and the new coach Osmar Loss knowing him well from the Corinthians’ youth teams, Léo Santos’ time has arrived. I doubt he will look back. With creating this list in mind, I watched the recent game between Corinthians and Atlético Paranaense, mainly to see how Pedrindo and Matheus Vital got on. Léo Santos ended up stealing the show. Not only was he playing out of position, in central midfield, but he was so comfortable on the ball. He has pace, he has height, he has good ball control, good passing and composure. What more do you want from a central defender? Can be compared to Marquinhos, in terms of playing style, and that they both began their careers at Corinthians. Big things are expected from this kid. He is only 17 years old, but his raw talent was enough to convince Real Madrid to fork out 45 million euros for his services. As they did with Vinícius Júnior, Real Madrid signed the contract with Rodrygo and ‘let’ him stay with the Brazilian club for another year. I say ‘let’, but FIFA rules stipulate that clubs cannot sign foreign players before they are 18 so they don’t have much choice but to wait. The fact that Real Madrid are willing to spend so much for such an unproven player shows how much talent he has. Like most Brazilian wingers, he is quick and skillful. He is right footed, but plays on the left wing for Santos, just like Neymar and Robinho did before him. Those are big shoes to fill, but with five league goals so far this season, he is living up to the hype. He also happens to play in the same position as Vinícius Júnior so it will be interesting to see how Real Madrid (and the Seleção) fit him into the same team. Nice problem to have. 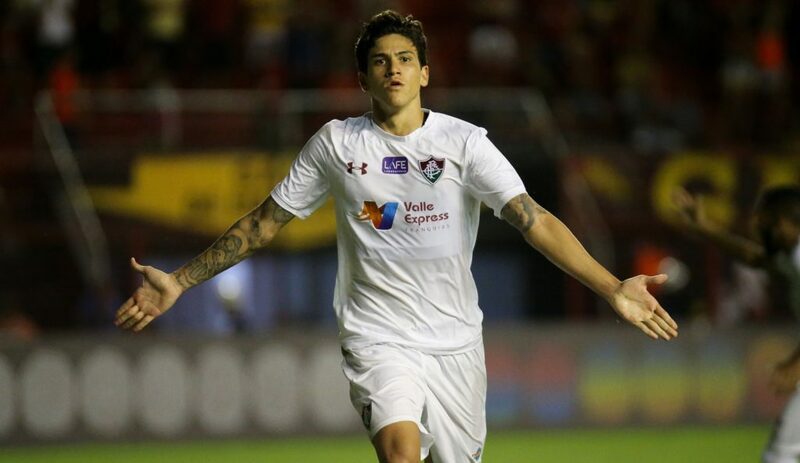 This young lad can’t stop scoring: he has 10 goals in 15 league matches this year and since Henrique Dourado left the club earlier this year, Pedro has become the main man for Fluminense. He broke into Fluminense’s team last year after the departure of Richarlison, scoring twice in 15 games (only six of them were starts though). Pedro scores all kinds of goals. Tap ins. Shots from outside the box. Headers. Right foot. Left foot. He is pretty strong and tall and his hold up play is very good. He hasn’t got silky skills like Neymar and Pedro is not lightening quick, but Brazil are crying out for an old fashioned number nine like Pedro. Expect him to be called-up by Tite for Brazil’s games against the USA and El Salvador in September. A call up to the was something of an open question a few weeks ago – see Brazilfooty’s recent post on the player. However, his goal and excellent all round performance against Bahia last weekend made a call up seem inevitable. Not only did he show an incredible touch and shot to score that goal, but his link up play was excellent. Bordeaux offered 8 million euros to buy him a few weeks ago, which was rejected outright by Fluminense, who want more than 20 million euros. Borussia Dortmund are now said to be interested. If I were them, I would hurry up before the asking price rises further. Lucas Paquetá may not be as young as some other players on this list, but he is my top tip to get to the very top. He broke into the Flamengo first team last year, but he is now the first name on their teamsheet. His good form has helped Flamengo climb to the top of the league, into the Copa do Brasil quarter finals and into Copa Libertadores second round. He was also selected in the 2018 Rio State Championship team of the year. He is a little bit bigger than your typical Brazilian tricky, skillful attacker and 5’11” (180 cm). But he still has great skill for his size. And as well as being able to take shots, score goals and get assists like other attacking players, he also makes his fair share of tackles. 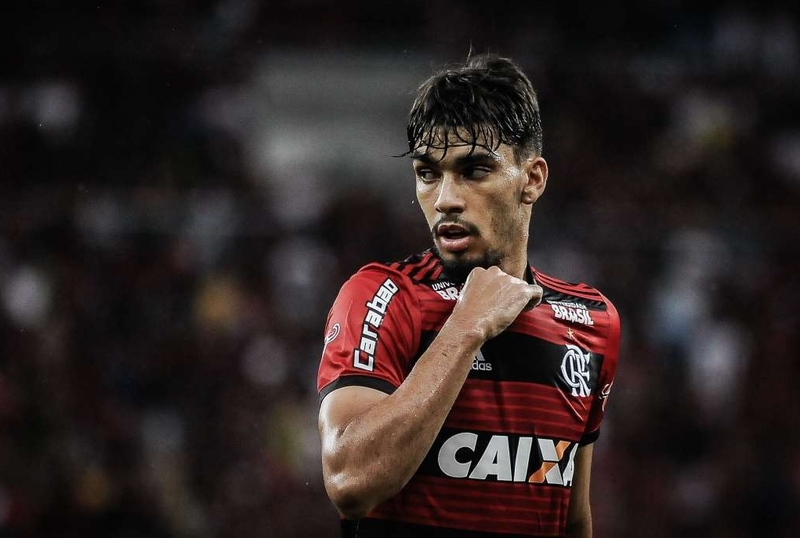 He might look a little bit like Kaká physically, but his playing style is different; Lucas Paquetá relies less on his power and doesn’t make as many driving runs; but he is more skillful and Lucas Paquetá has a better range of passing than Kaká. 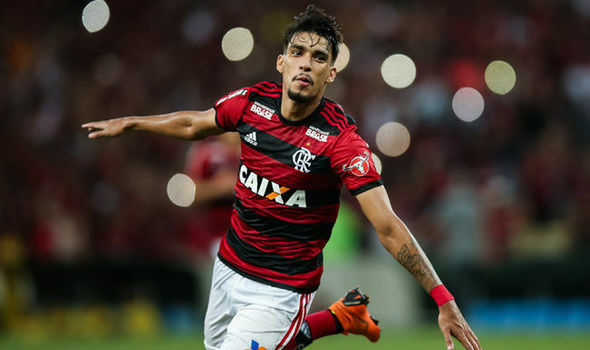 Lucas Paquetá is comfortable taking the ball in any tight position and he is always looking for an incisive pass or to create an opportunity with a piece of skill. He is nearly always asking for the ball from his teammates, and his teammates nearly always give it to him. Occasionally he is a little overambitious and not everything he tries comes off. But I don’t think the coaches at Flamengo mind too much. And the fans certainly don’t: people pay good money to watch football matches and see players like Lucas Paquetá. His good form this year didn’t go unnoticed and he was on the standby list for Brazil’s World Cup squad. He has also played for Brazil’s u20s. He has started nearly all of Flamengo’s league matches this year and scored five league goals, which is very good for a midfielder. It is only a matter of time before he gets called up to the Seleção and moves to a top European club. Expect the former to happen later this year and the latter to happen when a European side decides to fork out 45 million euros. Despite developing the likes of Ronaldinho, Douglas Costa and Arthur, there are no players from Grêmio on this list. They have some good young players – such as Pepê, Matheus Henrique (or Mathuesinho) and Thonny Anderson – but they haven’t yet quite showed enough to get into the top ten. In addition to Lucas Paquetá and Lincoln, Flamengo have several quality young players on their books, like Marlos Moreno, on loan from Manchester City. He hasn’t scored in ten league appearances for Flamengo, but the 21 year old forward has played eight times for the Colombian senior national team. 20-year-old attacking midfielder Jean Lucas was another candidate for the top ten. Santos continue to be a production line of talented footballers and the likes of Arthur Gomes and Yuri Alberto have potential – the latter is only 17 and has already broken into the first team. Meanwhile, Corinthians’ Pedrinho, Matheus Vital and Mantuan narrowly miss out. Pedrinho is very talented, but a lot of the things he tries nearly come off. The 20-year-old right winger has played 14 league matches for Corinthians this year, but has scored no goals. He needs to start finding more end product to fulfill his potential. Matheus Vital is only 20 years old and has played a lot of games for Corinthians this year and for Vasco last year. But he has only scored two goals in those 43 games, which isn’t the best record for an attacking midfielder. He is good, but he doesn’t take games by the scruff of the neck yet. Meanwhile, Mantuan stepped into Fagner’s shoes well this year, but I haven’t seen enough of him to say that he deserves to be in the top 10. Corinthians’ new signings – Jadson (21 years), Ángelo Araos (21) and Sergio Díaz (20) – are all highly rated. Look out for those names in the future. Iago, Internacional’s left back, just missed out on tenth spot. He plays every league match for his club, but when I saw him play, I didn’t see a winger bombing down the line in typical Brazilian full back fashion. Call me fickle, but he misses out on the top ten for that. Cruzeiro’s Murilo (21 years) and Botafogo’s Matheus Fernandes (20 years) have played a lot of first team football, but I haven’t seen enough of them to put them in the top ten. Bruno Silva (18 years, Chapecoense), Ibañez (19 years, Fluminense), Jhonny Lucas (18 years, Paraná), Caio Henrique (21 years, Paraná, on loan from Athletico Madrid), Júnior Brumado (19 years, Bahia), Brenner (18 years, São Paulo) and Arthur (20 years, Ceará but moving to Palmeiras next year) are other names to look out for. Where are all of the keepers, I hear you ask? 21-year-old Caíque, of Vitoria, was a candidate for the top ten, but he was recently dropped from their first team and sent to the youth team, after making a few clangers. He may have made a few clangers, but he has also pulled off a few wonder saves. His contract has a 5 million euro release clause and he has played for the Brazil u20s. He is a giant and stands at 1.98m. Caíque hasn’t lived up to his potential yet. But the potential is there. Cruzeiro’s giant 17-year-old keeper Brazão is another hot prospect. Enjoy this article? Leave a comment below – join the debate. Follow on Facebook or Twitter. Sign up to email alerts below. This entry was posted in Brazilian football, Scout, Seleção, Special report and tagged Andrey, Emerson, Flamengo, Gabriel Barbosa, Léo Santos, Lincoln, Liziero, Lucas Paquetá, Pedro, Rodrygo, Santos, Thuler by Brian Davidson. Bookmark the permalink. Brings to mind the defense of the Olympic title which by my estimate would be the most meaningful accomplishment for a Brasilian team at this point short of beating a European team in a World Cup knockout game. (The Copa America, Confederations Cup, and WC qualifiers just don’t do it for me anymore given the record of WC failure against the Europeans that looms over the entire enterprise.) Given Tite won’t call them despite their record of WC productivity relative to, say, Fernandindo and Willian who they could have replaced against Belgium to likely great benefit, would like to see David Luiz and Oscar considered as over-age players for the Olympic team.